Earlier I wrote about the automatic installation of Fusion Middleware components using response files. A thing that lacked in my scripts was that although I had a FMW_HOME variable set in my enviroment shell script, the response files had the location hard coded in them. At the time I hadn't had the chance to figure out how to do property/variable replacement in shell. I do know how to do it with ANT. But I figured that installing ANT for only this was a bit too much, since with the installation of FMW you already get ANT as a module. Although the first option was favoured by many and considered the answer on the querstion, I personally favour the second. It turns out that sed does not accept references to the environment variables as a replacement. And that makes the replacements hardcoded again. The second does accept environment variable references. Actually, if the variable-reference in the template file is already present in the environment, no actual replacement assignment have to be provided. How to solve JSchException Algorithm negotiation fail. And get logging out of JSch in SoapUI. I was so glad with my SoapUI solution to SFTP files to a server. But so dissapointed I couldn't have it working at my customer. Now I needed more information than that. But the hint is at least that there is a mismatch in the available cyphers client side verses server side. So first I wanted to get more logging out of Jsch. It turns out that it has it's own Logger framework, but the bright side of that is that you can easily wrap your own logging mechanism. In the case of SoapUI it is log4j. So create a java project with the libraries jsch-0.1.54.jar and from the SoapUI libs: log4j-1.2.14.jar. Then I created the following class file from an example from the answer in this stackoverflow question. * Class to route log messages generated by JSch to Apache Log4J Logging. * @param logger the logger from Apache Log4J. 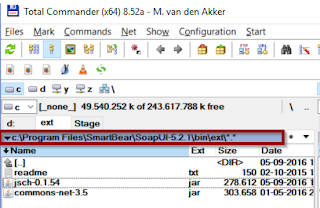 Then Jar it and add it to the bin/ext older of SoapUI (like in the previous blog post). So simply set the logger on the JSch class, before the instantiation. Then the logging of JSch appears in the SoapUI logging, as easy as that. It turned out that the server required the use of aes256-ctr, while the jre of SoapUI (which is Java 7 in SoapUI 5.2.1) has limited JCE policy. As is suggested here. For SoapUI, download the JDK 1.7 policy. Go to your SoapUI Home folder, and navigate to the security library folder within the JRE. For instance: c:\Program Files\SmartBear\SoapUI-5.2.1\jre\lib\security. Unzip the JCE to a new folder UnlimitedJCEPolicy within the security folder. Create a another backup folder like LimitedJCEPolicy and copy the jars US_export_policy.jar and local_policy.jar to the LimitedJCEPolicy folder. And copy the corresponding files from UnlimitedJCEPolicy to the security folder, replacing the original ones. Restart SoapUI and you're good to go. SoapUI is my favorite tool to do unit tests. I'd try to keep my self to test based development and build up tests along with the development service. 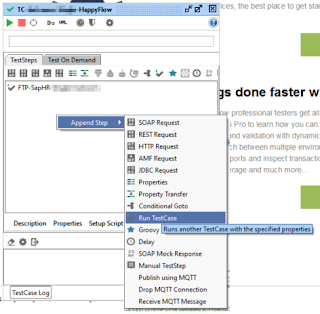 For SOAP or REST based services this goes quite intuitively using SoapUI. 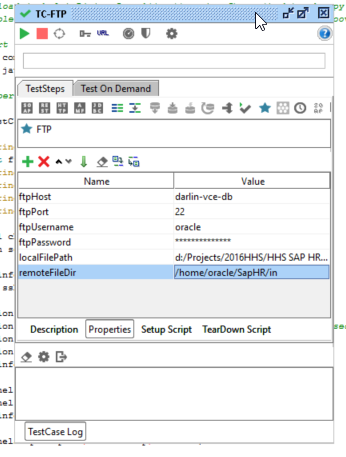 For database driven it is a little harder, but SoapUI has a nice JDBC activity, that supports DML as well as callable statements as stored procedures. But for files and especially SFTP its a little more complicated. 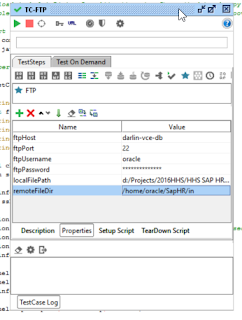 For a while I'm working on a filebased integration with SAP as source system. I configured and defined the SOASuite FTP adapter to use my SSH user (oracle) on my VirtualBox VM. Until now I tested it using the SFTP/SCP client from MobaXTerm (enthousiastically recommended: download here). But not so handy for unit tests. Changes I did was to define the input values based on the properties from the testcase. And move the session and channel variable declartions out of the try, to get it accessible from the finally branch. And to replace e.printStackTrace from the logging by e.message, to have a propery message (e.printStackTrace returns null) in the logging. 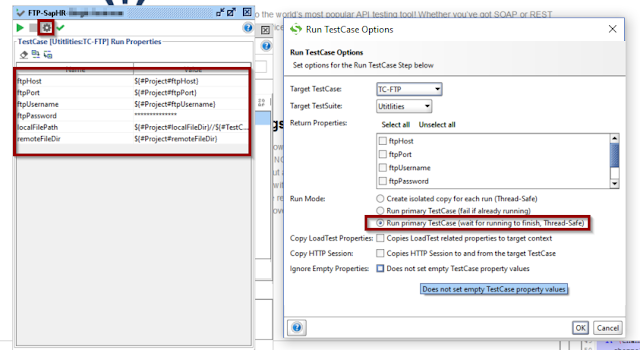 Choose 'Run primary TestCase (wait for running to finish, Thread-Safe)' option as Run Mode. And provide the property values. This script copies a file from a file location and uploads it. But I want to be able to insert some runtime specific options to refer to in asserts and later JDBC calls. To check on specific running instances. So I want to be able to adapt the content running in my test case. Actually I want to upload a string fetched from a property, maybe with expanded properties. convert the fileContent property value to an InputString. And that is given as an input to the statement sftp.put(fileInputStream, remoteFile);. Notice that since we upload file content, we need to provide a remoteFile path, including file name, insead of a remote directory. And that we need an extra import java.nio.charset.StandardCharsets. It would be nice if the guys from SmartBear add both put and get as a seperate activity. .... this is only a psuedo object? [12:18:01 PM] Target platform is  (Weblogic 12.x). The process domain is encountering the following errors while loading the process "HREmployeeProcess" (composite "default/CDMHRDomainService!1.0*soa_6e4206b5-3297-4f53-9944-734349aed8ab"): this is only a psuedo object. This error contained an exception thrown by the underlying process loader module. Check the exception trace in the log (with logging level set to debug mode). If there is a patch installed on the server, verify that the bpelcClasspath domain property includes the patch classes. [12:18:19 PM] Check server log for more details. [12:18:19 PM] ----  Deployment incomplete  ----. So the I was googling around, and found this blog entry. This one suggested a missmatch between the project and referenced wsdl's/xsd's in the MDS. So I refreshed the MDS, restarted the whole SOA Server, but no luck. At the doorstep of removing the lot of components and references, I decided to take a last closer look to the composite.xml. Since the wsdl defined in the ui:wsdlLocation attribute needs to be available on compiling and loading of the component by the component-engine it's recommended to use a reference to an abstract wsdl in the mds. In this case I replaced the ui:wsdlLocation in the service reference by the mds. But apparently I forgot the BPEL Comnponent. To replace that, you should do this in the partnerlink definition in the BPEL Process. Because the composite.xml is automatically updated. Because the abastract wsdl lacks the partnerlink types, as you might know, JDeveloper suggests to create a wrapper wsdl for you. Now, because of the synchronizations between bpel and the composite, you might need to hack the composite and the bpel process, to get thinks consistent again (at least I had to). But then, having it resolved, the composite was deployable again... And the BPEL process wasn't so pseudo anymore. A few months ago I figured out how to create specific users with restricted access to Service Bus components. I blogged about it in part 2 of creating WebLogic users for ServiceBus 12c. But the series lacks an explanation on restricted user access on SOASuite. Today in a question about Roles on Oracle Community Forums, the reference to this elaborate blog entry was given: Restricted View, by Antony Reynolds.